ABAUM'S WORLD: A Call to Service: Sign the Petition Today! On January 20th, Barack Obama will give his inaugural address to the largest crowd ever assembled for a Presidential Inauguration. Tens of millions of Americans will watch this historic speech. At that moment, President Obama was have a unique opportunity to follow in the footsteps of John Kennedy, and issue a call to service to the American People. At this time of great economic distress, more than ever we need Americans ready to put on a uniform or set aside a few hours a month to assist their fellow citizens, and help build the foundation for our new, more prosperous future. National Service is a fundamental public good that is already helping transform communities and individuals for the better. It provides much needed resources and manpower to areas of positive externality like Education, Health care and the Environment, and it gives young people an opportunity to earn money for college and acquire the skills needed to compete in a global economy. 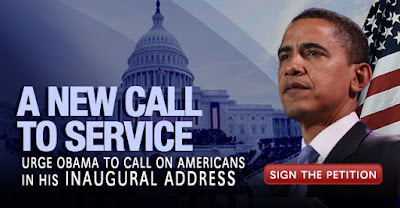 We need Barack Obama to issue a powerful call to service in his inaugural address. That is why I urge you to please go to http://servenext.org/ and sign the petition asking the President-Elect to make this an important theme of his upcoming speech. Together, we can be the change we wish to see in the world.